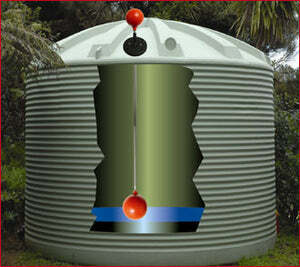 Visible ball rain water and tank level indicator – Freeflush Rainwater Harvesting Ltd. This clever yet simple device allows the level in a tank to be visually inspected at a distance. Unlike many water level indicators which require being close to the tank the highly visible ball can be seen at some distance, making inspection a quicker task. The Innovative uni-ball joint will suit any tank installation regardless of roof angle. Uni-ball adjusts to any watertank roof angle. Manufactured from UV resistant quality materials. Manufactured from UV resistant, quality materials. Useful for underground tanks where an external tank level indicator won't work.